Well, another excellent turnout on a really great evening to ride. 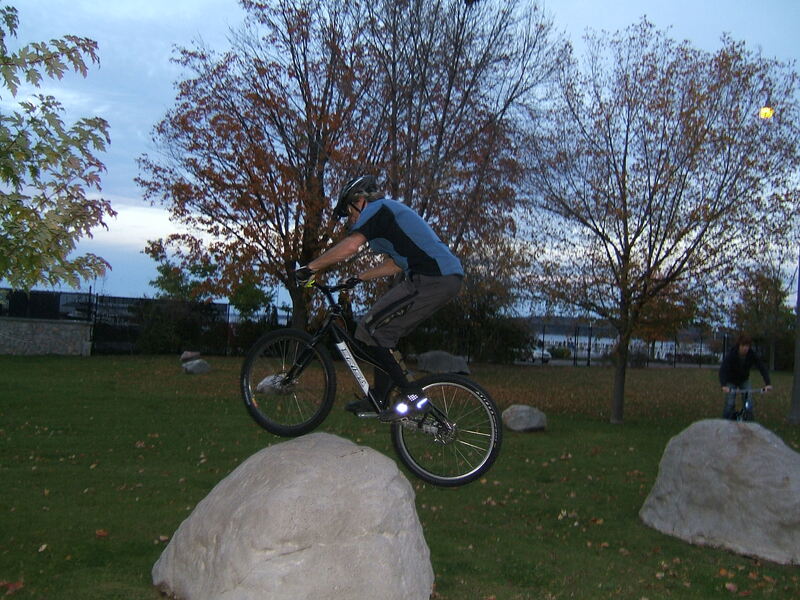 The 2WT rockhoppers came out of the dark and migrated to the faux rocks at the zoo early into the ride. There are some really good challenges, and lots of options on the rocks. It was good having Matt and Alan back, as well as Alisa. Some really solid riding, and lots of improvement from everyone! Goin’ Up. I love these rocks! Max riding the rails. He picked this challenge out himself – and he ripped it! Mark with a sweet looking one-footer on the rock. He was cleaning this by the end of the evening. You can roll this one too!! Mark rolls the high line – impressive! Max going for it on the breakwall ledge. Lots of progression for Max tonight! Alan takes on the turtle too! It is so cool to see everyone riding and improving themselves. What a great group!